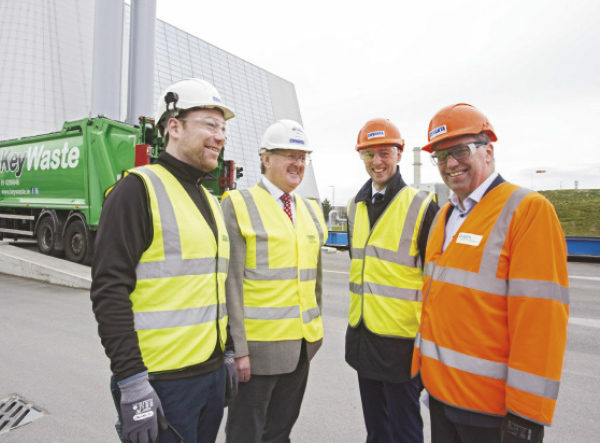 Dublin Waste to Energy facility has accepted its one millionth tonnes of residual waste at its facility at Poolbeg in Dublin. It was delivered by Keywaste Ltd., which is one of the companies contracted to deliver waste to the facility. It has been operating since June 2017 and is currently accepting 600,000 tonnes of waste per year. Since beginning its operation it has produced over 700,000 megawatt hours of electricity, resulting in over 100,000 homes being supplied with renewable energy. The Dublin Waste-to-Energy project is a Public Private Partnership (PPP) between Dublin City Council (acting on behalf of the four Dublin Local Authorities) and Covanta, a world leader in providing sustainable waste and energy solutions, to provide a thermal treatment plant to treat municipal waste that cannot be reused or recycled. Located in Poolbeg, in Dublin Port, the facility provides the Dublin region with a long-term sustainable and environmentally superior waste management solution, enabling it to divert post-recycled waste from landfills and become locally self-sufficient in managing waste, consistent with regional, national and EU waste policies. Annually, the facility generates clean energy to supply 80,000 homes, reducing Ireland’s reliance on imported fossil fuel, and has also been designed with technology and infrastructure to provide enough heat to meet the equivalent needs of over 50,000 homes.